The opportunities to teach volleyball to young kids are few and far between in a state with no High School or Middle School Volleyball Programs. We've offered a free clinic a couple of times, and participated in Girls in Sports day, but there just isn't a lot of organized volleyball here in Vermont. However, one local elementary school has offered a volleyball class for the past two years. The Bridge School is a private, alternative elementary school that allows it's students to choose their "arts" classes. Each class lasts for two weeks, and can very greatly depending on the interests of the kids, and the availability/expertise of the teachers and local community members. As an example, the choices for the past two weeks were: ice skating, stretching and relaxation, or volleyball. For the past two years one of the favorite choices has been Volleyball! 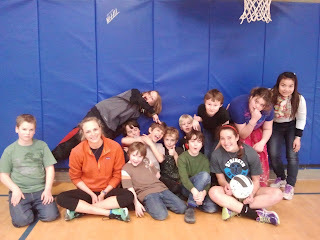 Another alternative school (grades 7-12) in Burlington comes down to teach volleyball at the Bridge School for one week, and my team has done the other week. 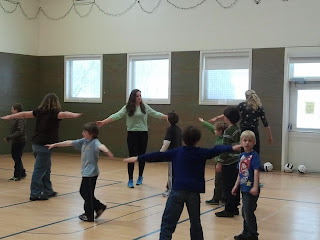 The students in the class range from 1st through 6th grade, so the players are challenged to make it fun and appropriate for a wide range of ages and abilities. They're all new to volleyball, and it's been great fut to see them learn new skills! 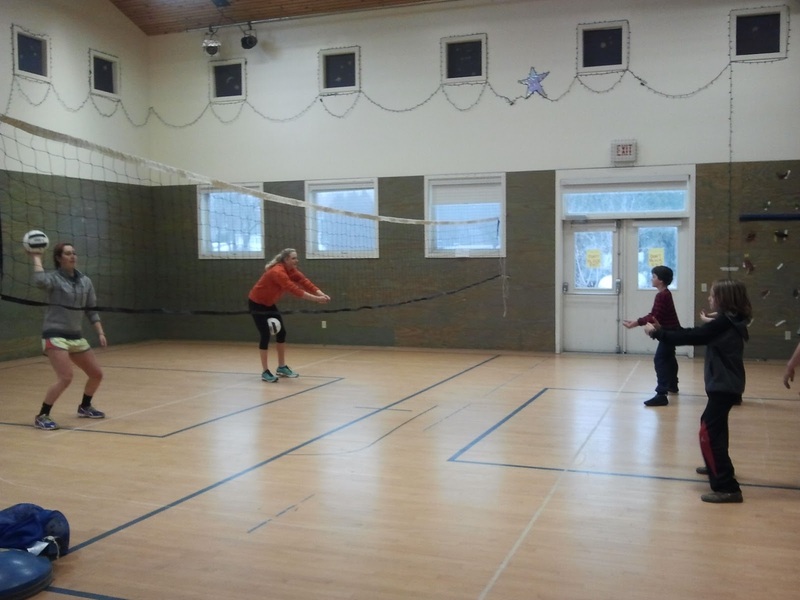 The kids are having a great time learning about volleyball, practicing the skills, and getting the hang of the teamwork involved in the game of volleyball. They start out by getting warmed up and moving their bodies, followed by some basic skill work, and then play various types of games that relate in one way or another to the sport of volleyball. As you can see from the picture, it's quite a bunch. 9 boys and 1 girl make up the class, so the team has had their hands full with little boy energy!! Olivia has been the point person for this project, but several others have been involved as well. Piper has been a regular, Lizzy even made an appearance after returning from MiddCORE, Maddie and Lauren went for a day, and so did Kathryn. Thank you all!! The kids LOVED it! !